Newlywed Helga wants nothing more than a life of peace and bliss; instead she finds herself with a husband dying of an unknown illness and no way to save him. When a mysterious old volva comes to town offering a cure, Helga is forced to travel beyond all she knows to the boundaries of the prim, the border of reality, to barter with fay beings for a substance known only as the water of awakening. Helga soon finds that the journey is more perilous than anyone had thought, with danger coming not just from wolves and men, but from wizards, dragons, and twisted creatures beyond imagining. Surrounded by strange magic, but aided by a group of uncanny talking ravens, Helga begins not only to gain the skills necessary to survive her ordeal, but begins to awaken to her true self… and a power long dormant. 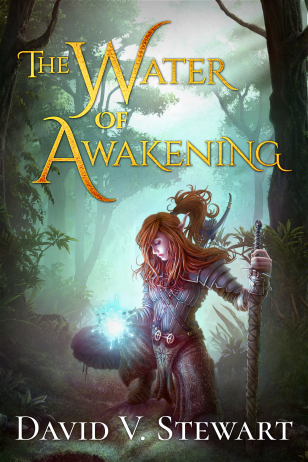 A new High Fantasy book from David V. Stewart with plenty of unexpected elements, The Water of Awakening is sure to please fans of classic adventure and heroic fantasy stories. The Water of Awakening is my fourth published work and will be available on July 7, 2017. It was my first book to be completely in the high fantasy genre, specifically the heroic fantasy (or sword and sorcery) and adventure fantasy sub-genres, though of course I through in some hopefully unexpected elements as well. The Water of Awakening was written between March and May of 2017 and, unlike my previous work, I kept it a near total secret until it was completed and I was beginning to revise it. Normally I post samples or serialize a work here on DVS Press, but I wanted to try a different work approach for this work, partially because I wanted to embrace more fully my introverted work habits, and partially because I knew this book would be complicated and require me to revise differently, altering many things in the narrative to make the entire work flow properly. I enjoyed the process of writing this book tremendously, and cannot wait to bring it to market. Look for samples to appear here on the site in the coming weeks!